NEW! The playing sheet mixes together fun and education. The additional accessories increase the number of games and ideas! 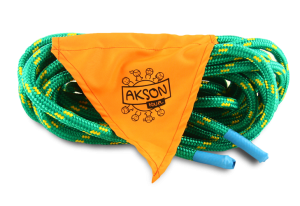 Educational playing sheet AKSON includes 12 colorful pieces with hook-and-loop fasteners to add accessories. The hook-and-loop fasteners are high quality, so you can use them over and over! 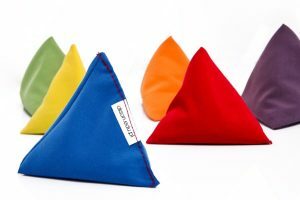 Accessories includes set of fruits which are in the colours of playing sheets. It makes the learning process easier and faster! The educational playing sheet is similar to classic version of playing sheet and fulfill all the expectations as well as gives much more opportunities to learn colours, name of fruit, shapes. Playing with the sheet is perfect solution to have always interesting time while learning. Say stop to boring activities! 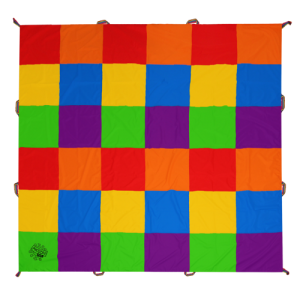 Colorful sheet takes your attention, develop focus skills and creativity of all the players – children and adults. It supports integration process and increase imagination. 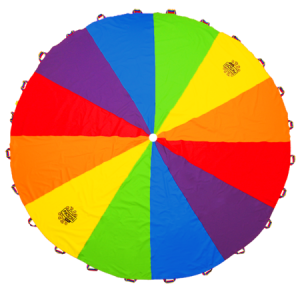 It improves hand-eye coordination and gives so much joy! 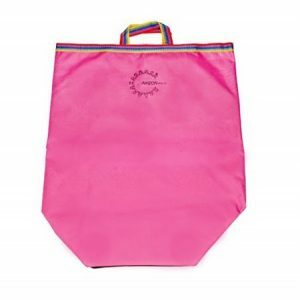 Playing sheet is made with durable and waterproof fabric, which is easy to keep clean. You can use playing sheet everywhere – indoors and outdoors. The sheet has 24 handles and webbing binding. NEW! The playing mat mixes together fun and education. The additional accessories increase the number of games and ideas! Playing with the mat is perfect solution to have always interesting time while learning. Say stop to boring activities! 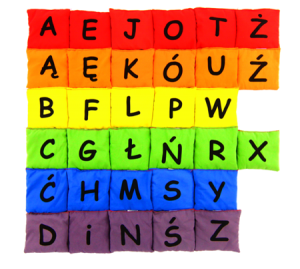 Colorful sheet takes your attention, develop focusing skills and creativity of all the players – children and adults. It supports integration process and increase imagination. 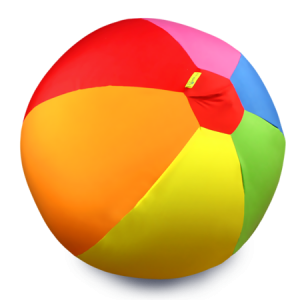 It improves hand-eye coordination and gives so much joy! 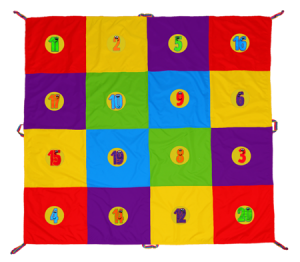 Educational playing mat includes 16 colourful squares 50 cm x 50 cm with round hook-and-loop fasteners on every square (diameter 15cm). The hook-and-loop fasteners are durable and moveable so not only you can use them to put additional elements on the mat but also separately in different games. The hook-and-loop fasteners are high quality so you can use them over and over. Other accessories are smiling numbers from 1 to 20. Vibrant colours of the number fasteners make the playing joyful. 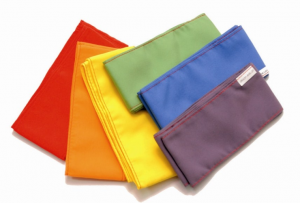 Playing mat is made with durable and waterproof fabric, which is easy to keep clean. You can use playing sheet everywhere – indoors and outdoors. The sheet has 8 handles and webbing binding. You can use the playing mat in many ways – put on the ground, hold in hands, hang on. Colourful chequered style attract everyone’s attention. Many hook-and-loop fasteners give a chance for unlimited ideas of games. 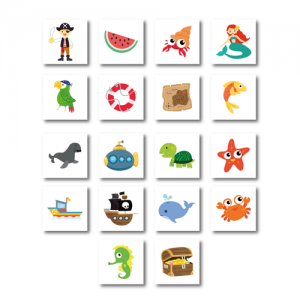 You can learn counting, colours, shapes, fruits and much more! NEW! New playing sheet combines together the positive aspects of traditional playing sheet and dartboard game. 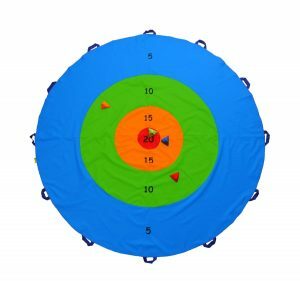 Dartboard playing sheet contains 4 colorful circles in different colour and also different score (blue 5, green 10, orange 15, red 20). 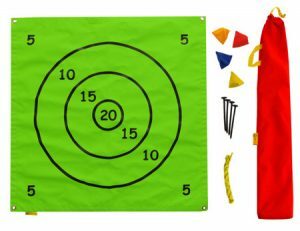 Games with the dartboard playing sheet is perfect idea to have attractive activities for children and adults. The colorful sheet takes your attention, develop focusing skills and creativity of all the players. It supports integration process and increase imagination. 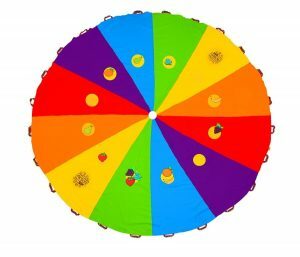 It improves hand-eye coordination and gives so much joy! The dartboard playing sheet is made with durable and waterproof fabric, which is easy to keep clean. You can use playing sheet everywhere – indoors and outdoors. The sheet has 12 handles and webbing binding. Target toss game is a very popular game for everyone. Now, you can play this game everywhere thanks of the mat! The chequered playing mat open the possibilities for many games and activities. It supports integration process and increase imagination. It improves hand-eye coordination and perceptivity. The chequered playing mat is made with durable and waterproof fabric, which is easy to keep clean. You can use playing sheet everywhere – indoors and outdoors. The sheet has 12 handles and webbing binding. The set includes nice cover case which let you take the mat everywhere! 36 colorful squeres give so much fun! The best playing sheet on the market! 36 handles – professional playing sheet 3,5 m, 4,5 m, 7 m.
Creative playing sheet is a renovation on the entertainment market! Let the participants have fun! Wake up the fantasy and design your own patterns using pens! The creative playing sheet is made of the best quality fabric on the market. This fabric is light and transparent, with special properties that allow it to be painted with the included pens. Pens, which are produced by the Spanish company JOVI, are easy to dispel, so you can easily and quickly remove colored paintings using a small amount of water or in a washing machine at 40 ° C. The washed cloth dries very quickly. Although the removal of paintings is very easy and does not require much effort, the paintings themselves are permanent, aesthetic and, above all, clearly visible during the animation. 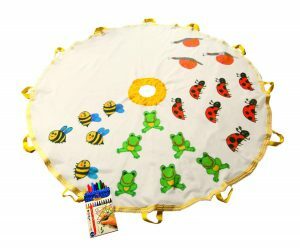 In addition, this creative playing sheet keeps all the standard functions of the animation parachute, develops reflexes , coordination , allowing you to enjoy the joy of moving and staying in the group. If you want to keep the paintings on the sheet easly just iron the fabric. A practical cover with a convenient, closed pen pocket is attached to the creative playing sheet, thanks to which the markers will never get lost. Thanks to the Creative Shutter AKSON you will expand the range of games and animations that you can do with it, the only thing that limits you is your imagination! Let yourself be carried away by creative play! 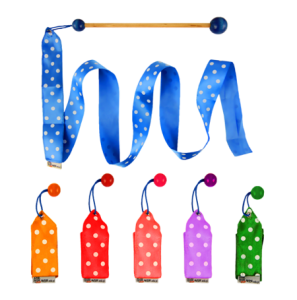 Ribbon works perfectly during rhythmics, fitness classes and, above all, artistic gymnastics both at home and in didactic facilities. Thanks to its lightness, it is perfect for choreographic and artistic classes. It makes each dance show more attractive. Available in color: orange, light green, white, yellow, black, dark green, pink, red, blue, silver, gold. 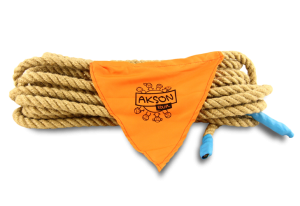 Akson Junior ribbon was created for the youngest. It is perfect for working with children already in pre-school age , during rhythmic classes, and thanks to its lightness it is ideal for various types of physical activities. 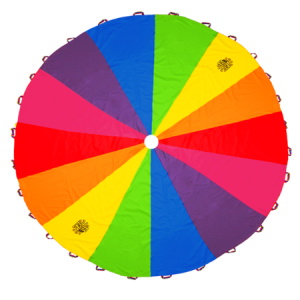 It is an element that will make each class more attractive , thanks to vivid colors that attracts the attention of the youngest participants of the game. Junior gym ribbon is carefully made , and most importantly it is safe, does not have any metal elements or sharp endings. The material part is made of a glossy, colorful tape with white dots. 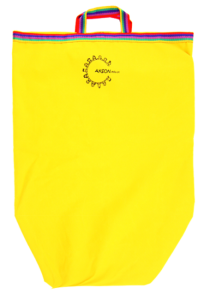 Akson gym bag is an exceptional help during the animation, didactic and corrective-movement activities. It is an important element of equipment for every teaching, gymnastic and play facility. 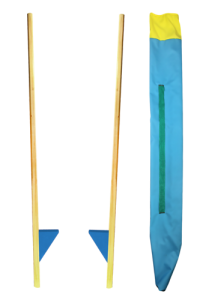 Perfectly suits for games and exercises with a professional playing sheet, animation and gymnastic games . Available in six colors : green, yellow, orange, red, purple, blue. Filled with polypropylene granules. Washable. 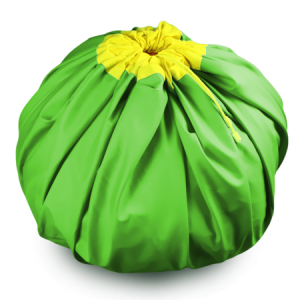 The PYRAMID bag is also great for learning to juggle and fill the poi. Available in six colors: green, yellow, orange, red, purple, blue. Colorful magic ball XXL is an absolute hit! 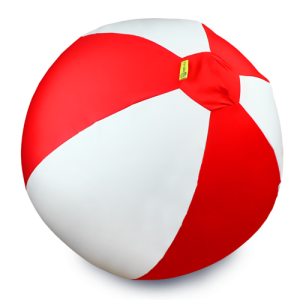 The XXL Akson balloon ball is a great way to make the integration games, animation games, clown gags more attractive, also used during training sessions in groups of small athletes. closing the balloon, thanks to which the balloon can be used many times. 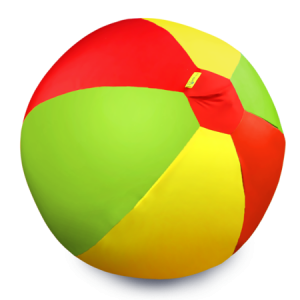 A colorful case of a balloon ball protects the balloon from a crack and adds fun to the attractiveness. 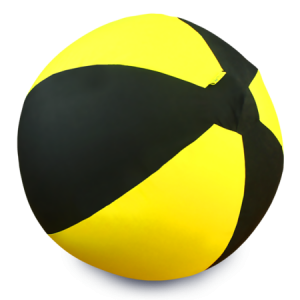 Magic ball XXL is available in different colors, new, attractive color combinations. is also very practical, despite the huge size it will fit in your pocket, bag and backpack. 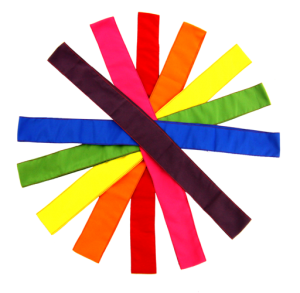 Gymnastic sash is made of pleasant to touch and durable material with vivid colors. It is a great tool for gymnastics, team games, group work, integration activities . 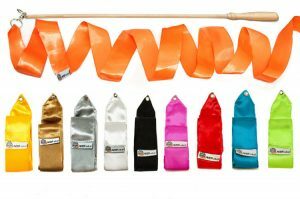 AKSON gymnastic sashes are a great help during animation games and corrective and exercise classes. It is an important element of equipment for every teaching, gymnastic and play facility. An unusual attraction during play and animation for groups of all ages . 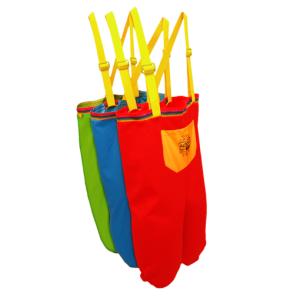 Playing trousers can give you a lot of fun of the game, they will be great at classes with children, picnics and family competitions as well as at the integration party. Playing trousers tripple is a set of three colored pairs of trousers, connected with each other permanently, strong, durable seam. 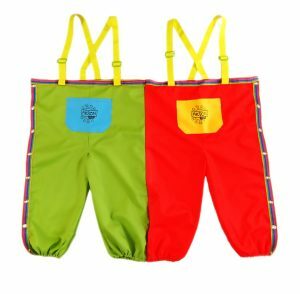 Playing trousers double is a set of two colored pair of trousers. Pants are made of durable, waterproof material, easy to keep clean, the whole is additionally padded with reinforcement tape. In the front, there is a pocket that also opens up new possibilities in play. Running together in trousers supports the development of motor coordination , teaches cooperation, trains the ability to communicate and mutual understanding , at the same time allows you to enjoy the joy of moving and being in a group. 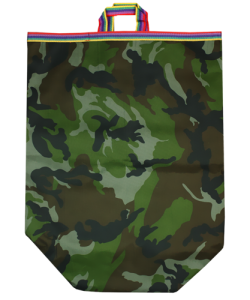 The jumping bags are made of very strong , waterproof polyester material , additionally reinforced from the bottom with a double layer of material. 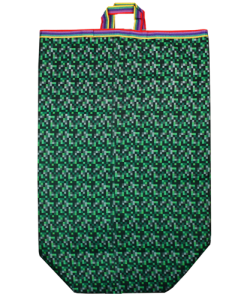 The bag has handy handles, making jumping even more convenient. The bags can be washed in a washing machine or by hand. Available in three sizes and many color options. They work very well in many movement games in the room or in the open air . They develop motor and motor skills, and they also encourage exercise of the whole body muscles. This is the ideal product for racing in distance races. It is a great tool for team games, group work and integration activities. It works very well in didactic facilities, making it possible to enjoy the joys of movement and being in a group. 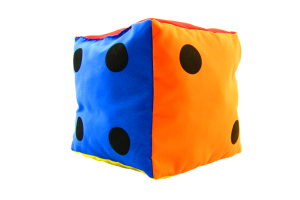 Each side of the cube has a different color and different number of dots or diffrent number. 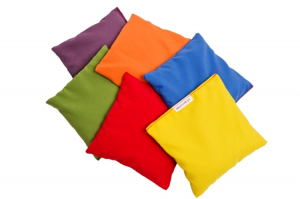 Filled with plush in the middle makes it extremely light and soft to the touch so you want to toss it all the time. 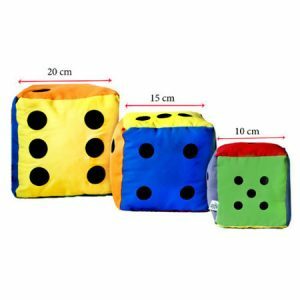 Available in three sizes: 10 cm, 15 cm, 20 cm. Material: colorful, durable, soft to the touch. quality materials. It has specially contoured wooden handles for comfortable grip while jumping and a string in polypropylene casing , so that the product is pleasant to touch and safe for children. 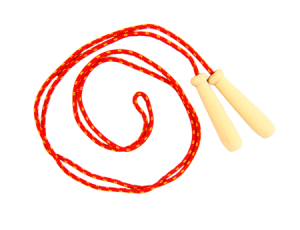 Skipping rope is designed for exercise and recreational activities for children in each age. The product is made of high quality materials. It has specially contoured wooden handles for comfortable grip while jumping and a string in polypropylene casing , so that the product is pleasant to touch and safe for children. Animation ropes are made of a strong and durable rope with apolyestersheath , making it pleasant to touch . They are made of high-quality , non-toxic and certified materials , thanks to which they are safe for children and are characterized by high durability. Animation lines are a unique didactic aid used during recreational and movement activities , as well as in schools during physical education classes. Ropes are a perfect element of children’s and youth’s play in all ages, both indoors and outdoors. Ideally suited to play with dragging a rope and many more. New size – new possibilities! 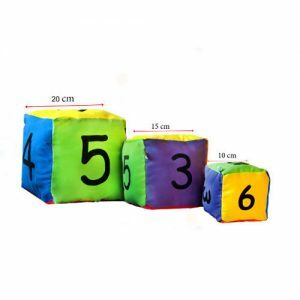 XXL cube is a great combination of an educational toy with a puff that is comfortable not only for a toddler. Ideally suited to classes with the youngest and adults. 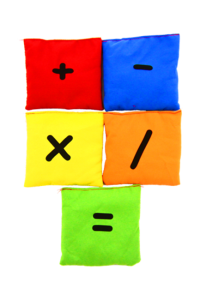 Educational cube is a great tool for team games, group work and integration activities. Each wall of the cube has a different color and different number of dots. 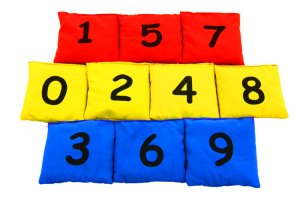 Filled with plush in the middle makes it extremely soft to the touch so you can toss, roll, roll on the ground, sit on it and even lie. Durable and strong material allows free play outdoors. Wall colors of cubes: purple, blue, green, yellow, orange, red. 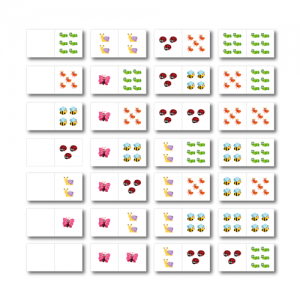 Memory game is a fascinating game that allows you to practice the memory of perceptiveness and reflexes, develops visual-motor coordination and the ability to concentrate. Colorful illustrations attract attention and give the participants a lot of fun. 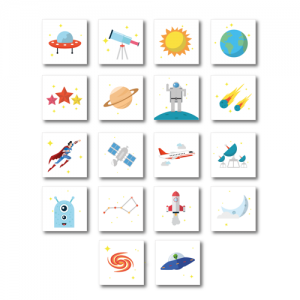 The domino game is a fascinating game that allows you to practice perceptiveness, reflexes and the ability to think logically, develops visual-motor coordination and the ability to concentrate. The large format gives new possibilities, and the game gains in attractiveness: it allows you to play in a large group, it is ideal for older and younger children, it will be perfect in the outdoors and indoors. Colorful illustrations attract attention and give the participants a lot of fun. The game is also an ideal teaching aid, it will allow for colorful learning through play. 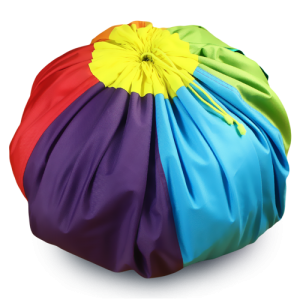 The animation bag was created for children, their parents and animators. 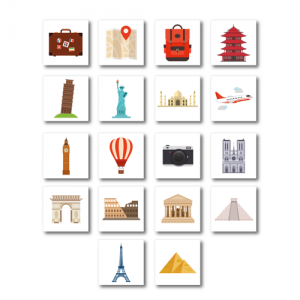 – wide range of applications ! Stilts are an ideal way to practice coordination skills as well as a great form of fun for both children and adolescents. Suitable for classes in primary schools as well as for playing with your own child. It works very well during games and outdoor activities. Stilts are not only fun, but also training to improve the sense of balance and balance. 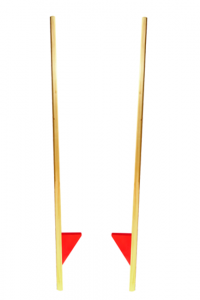 Akson wooden crutches are distinguished by comfortable rounded edges, thanks to which they lie much better in the hand and supporting them is even easier. They are made of the highest quality natural wood, impregnated, with colored footrests. Stilts are designed for outdoor use. Just go on stilts and feel like a real circus performer!